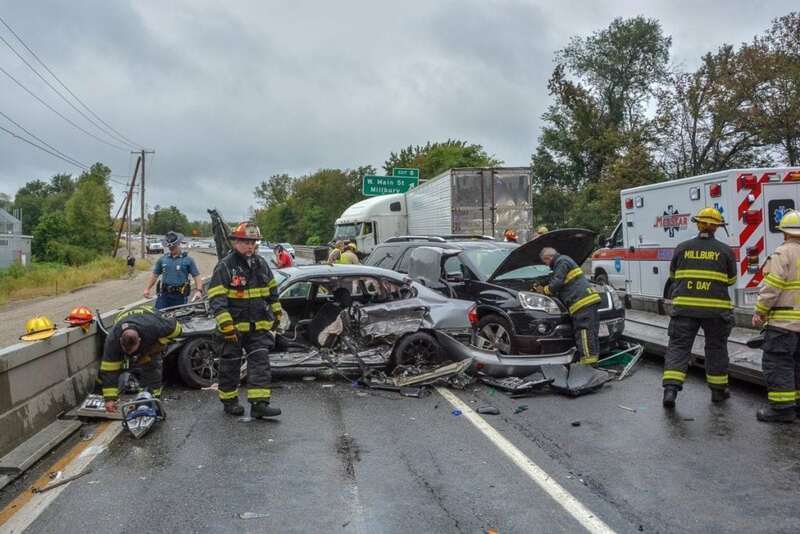 Just before 4PM on Wednesday, September 12th, Millbury Police and Fire Departments, along with several other surrounding towns, responded to a serious multiple car crash on Route 146 Southbound near exit 8. A total of 6 vehicles, with 1 rolled over, and a tractor trailer were involved in the crash. A portion of the truck was hanging over the center barrier of the north and southbound lanes. Two people were trapped inside their vehicles, and were extricated using the jaws of life, and transported to local hospitals with non life-threatening injuries. All vehicles are in the process of being removed, and a fuel spill from the tractor trailer is being cleaned up. Avoid the scene if you can. Traffic is backed up from before Route 20/Southwest Cuttoff in Worcester, past The Shoppes At Blackstone Valley to Boston Road in Sutton. More photos from the scene are below from the Millbury Fire Department, courtesy of Edd Cote.